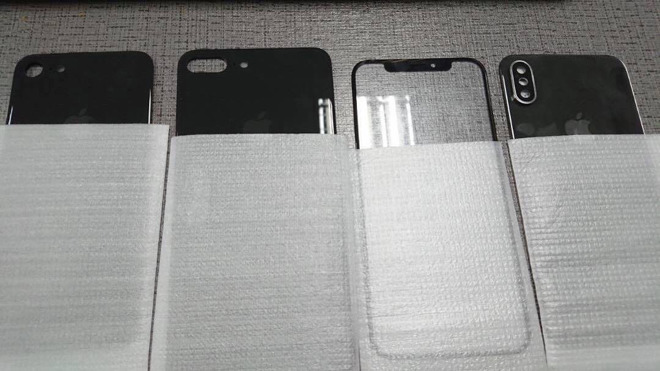 Photos published on Monday allegedly depict the front and back panels of Apple's three 2017 iPhones, falling in line with rumors —though there may be a reason to question their authenticity. 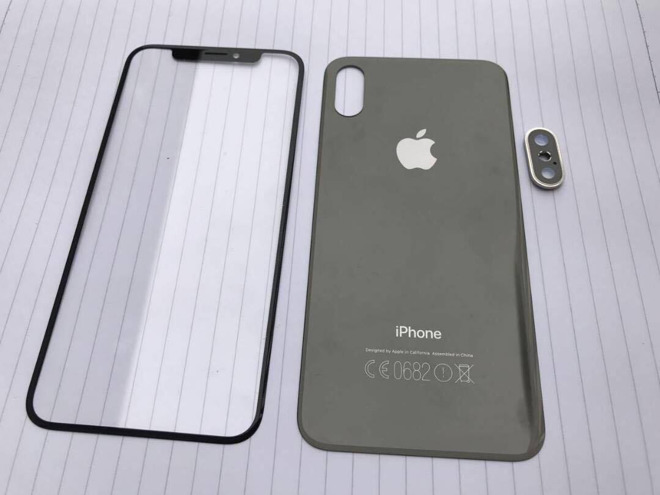 The "iPhone 8" panels, seen on Reddit, nominally support claims of an edge-to-edge display, a glass back, and a vertically-aligned, dual-lens rear camera. If accurate, the images also support rumors that the display will be interrupted near the top for the front-facing camera, microphone, and sensors. Less is shown of panels for the "iPhone 7s" and "7s Plus," but these do reinforce notions that the phones will be largely unchanged from their predecessors on the outside. They should switch to glass backs for the sake of wireless charging, like the "iPhone 8." Raising doubts about the leak is the rear "iPhone 8" panel, which contains extra markings not seen on recent iPhones, such as the "Conformite Europeene" (CE) safety logo. The parts were reportedly delivered to Chinese manufacturers last week. Apple is expected to announce its new iPhones at a September press event. LCD-based "7s" models will likely be ready immediately, but the "iPhone 8" —which should feature a 5.8-inch OLED display with embedded Touch ID, among other upgrades —may ship later in the year, given that mass production is only rumored to be starting in October or November.